The weather and the shortest daylight hours of the year dictate what you can do and where you can go in the outdoors at the moment. As a result my extended Sunday walks tend to be close to home at Gallan on Mangerton Road in Muckross in Killarney. Yesterday I wanted to get some photographs of that maple I mentioned a week ago. At the western/lake-side end of Muckross Gardens the Japanese maple still shone out. 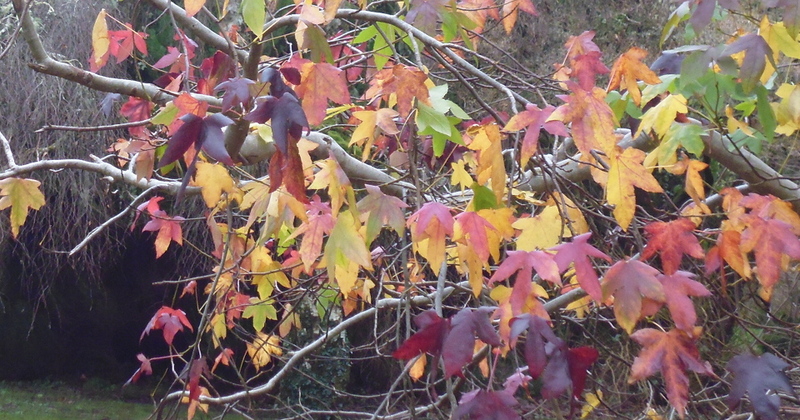 It still had lots of leaves – and many more on the ground – ranging in colour from full green, through bright yellow to dark crimson and all of the shades in between and a whole range of combinations. A huge Scots Pine fell on that western edge of the garden a number of years ago and now its six or seven trunks look even bigger – abandoned, untrimmed and untended, like so many trees in the woods now, their numbers added to yet further to in recent storms. The Norway maples on Ross Island were the first to make a spectacular splash of Autmn colour in early October. Because of the flooding I haven’t been able to get in to the Ross Island trees but in Muckross the maples are not only the last trees with Autumn colour but are almost the only ones with any leaves. Maple wood is used for violin-making. My mention of the high level of the lake waters on Saturday’s radio programme encouraged a man to come from Tralee to see for himself. “It was exactly as you said,” he told me. Though by yesterday the levels had dropped enough to allow me to walk out to Dundag headland with its great panorama over Muckross Lake … with it’s sheer backdrop of Torc mountain and the less imminent bulk of Glena, Purple and Tomies. 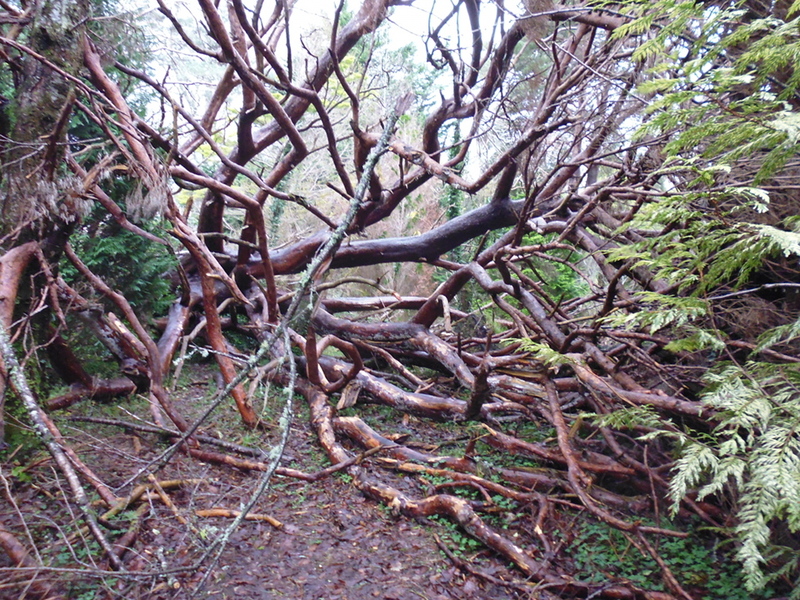 The southern end of the Jackoboys/Arthur Young trail were still completely inundated so I backtracked and walked along the Arboretum’s western edge/the boundary with Muckross Gardens. 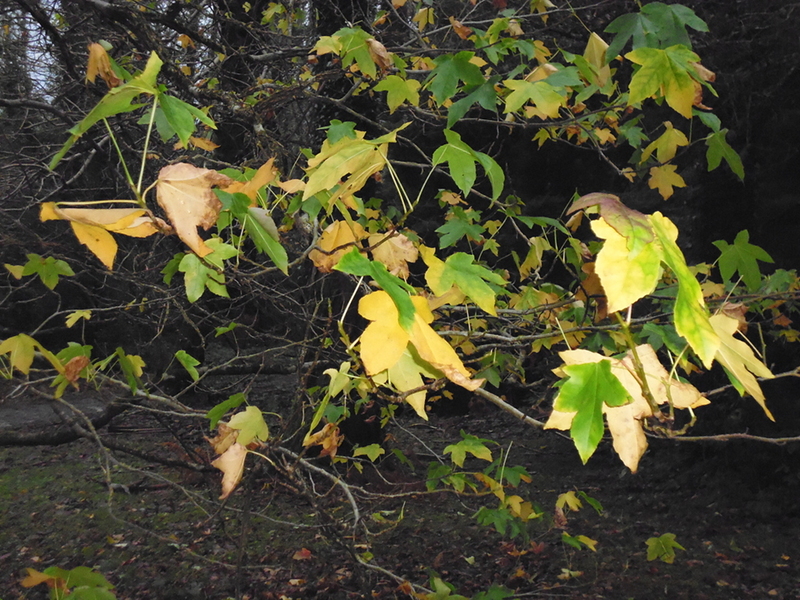 Here a Norway maple was the last tree in leaf but in this case the leaves were almost all green with a little yellow. 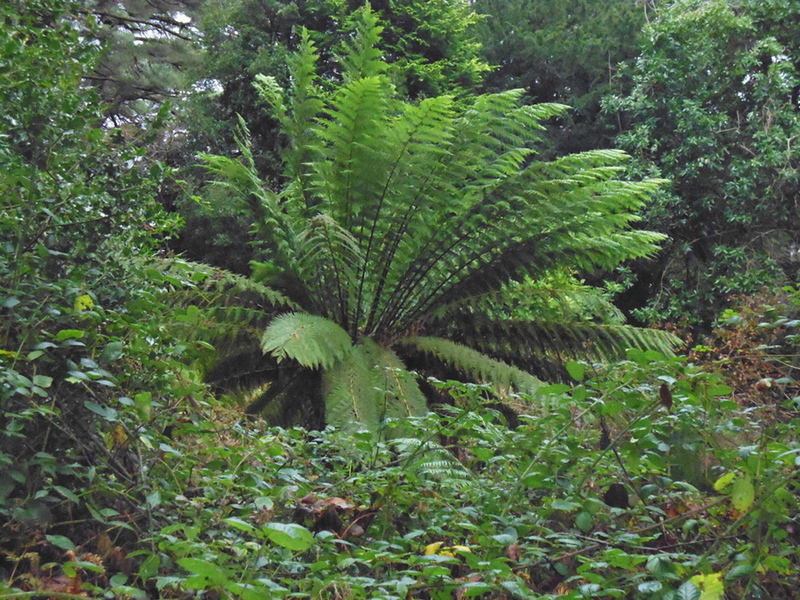 The direct path from the arboretum to the formal gardens is dominated by evergreen conifers with a lush tree fern as a centre piece. 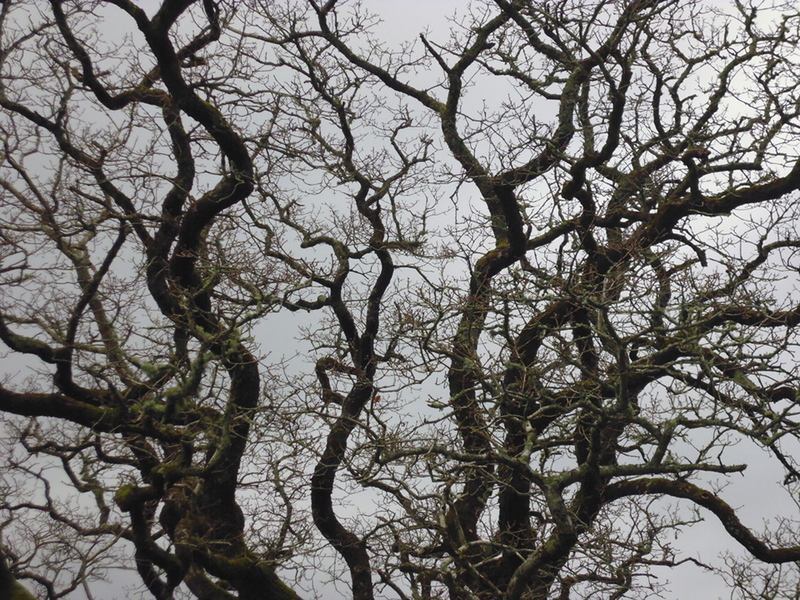 The image of a tropical rain forest again came to mind – as it had a week ago. The great oak in the middle of the formal gardens, now bare of leaf, shows the enormous complexity of the structure of the tree. This morning as I worked at my desk two unusual sights. A heron circled and dived high in the sky. Within minutes just above ground level four cavorting jays – our most exotic native bird with its bright flash of blue against a buff background. The only other time I had seen more than one jay was high over the banks of the River Moselle in Germany. This surely must be an omen! If you would like to stay at Gallan Eile you can book by clicking the button.